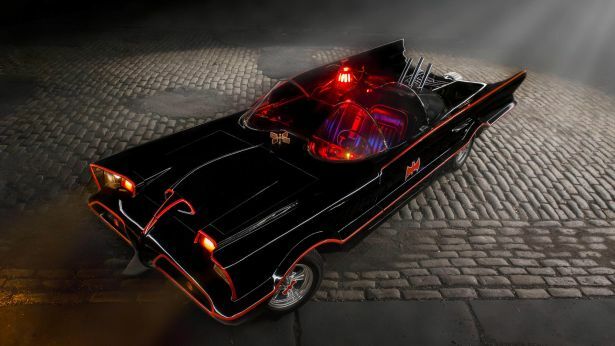 Any Batman fan that knows anything about the hit franchise will recognize the significance of this one of a kind vehicle. The sleek and unmistakable design and the dark, streamlined profile are hard to miss or mistake for anything else. Unlike the other iconic vehicles that were constructed by George Barris, this beauty was constructed by a lifelong fan of the caped crusader. Utilizing only photos and the designs he took from the popular TV show to guide him, Jim Sermersheim managed to create this stunning masterpiece in 1966. Taking the chassis from a 1958 Ford Thunderbird, Sermersheim managed to capture every vivid detail both inside and out, recreating the legendary vehicle in all its nostalgic glory. It’s little wonder that his vision was sold at Mecum Auctions for nearly a quarter of a million dollars. It took roughly two years for this car to reach Barris’s attention, but not long after it did he managed to acquire the impressive vehicle and then slapped a design patent on in as quickly as he could. From that point on it was recognized as being his own design, leaving Sermershein out in the cold so to speak. So it is important for all Batman fans to note that Hollywood only demanded four Batmobiles, which were the original design and the three replicas that were used on TV. In truth however, the fifth was only deemed a Barris product once it was acquired and patented. The no. 5 was kept in storage for a number of years before Barris sold it off, adding on a letter that it was Barris Batmobile and his own patented design. Once it was purchased the no. 5 was restored back its original glory, and in the late 1980s it was sold by its owner to the individual that currently owns it. This owner then gave it to her husband, who is a dedicated Batman fanatic. Unfortunately for the new owner certain licensing restrictions are in place that prevent them from showcasing the car in public view without paying a fee to Barris Kustoms to avoid infringement. Not long after this the owner decided to put no. 5 up for sale again. The car is a true work of art and deserves to be out on the road, which is why the current owner is hoping to find a buyer that is willing to work with Barris Kustoms or at the very least find a way to display the car so that it can offer a true sense of enjoyment without having to pay into Barris any further. The Batmobile is an iconic and impressive vehicle that deserves to be shown off and even taken around town considering its hefty price tag and the hard work and dedication that went into its making. Unfortunately, any buyer that is willing to afford the initial cost must keep paying to even take it out of the garage. For a diehard fan that can make that sacrifice, this car would be a dream come true.